Connie Performing Live at VIP Night Club, Gilroy California. 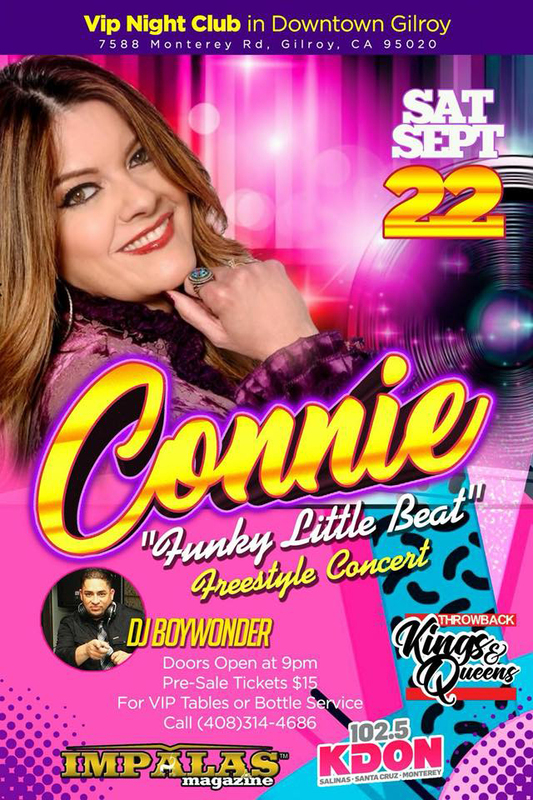 Impalas Magazine presents Freestyle Diva Connie, performing live. September 22, 2018 at VIP Night Club, in Downtown Gilroy. 7588 Monterey Rd., Gilroy, California 95020. Doors open at 9:00 pm. Pre-Sale Tickets $15. For VIP tables or bottle service call 408-314-4686. Featuring on the turn tables: DJ Boy Wonder. Mark The Date. See You There!!!! Previous Article Previous Article: CONNIE LIVE THIS FRIDAY!